If you want your wedding to be unforgettable in all ways, creating a website to honor your special day, or creating a beautiful online wedding invitation is going to help you accomplish this. Now, we all know that good things don’t come free, and surely you’re thinking that such a website costs a fortune, but it doesn’t have to be so. 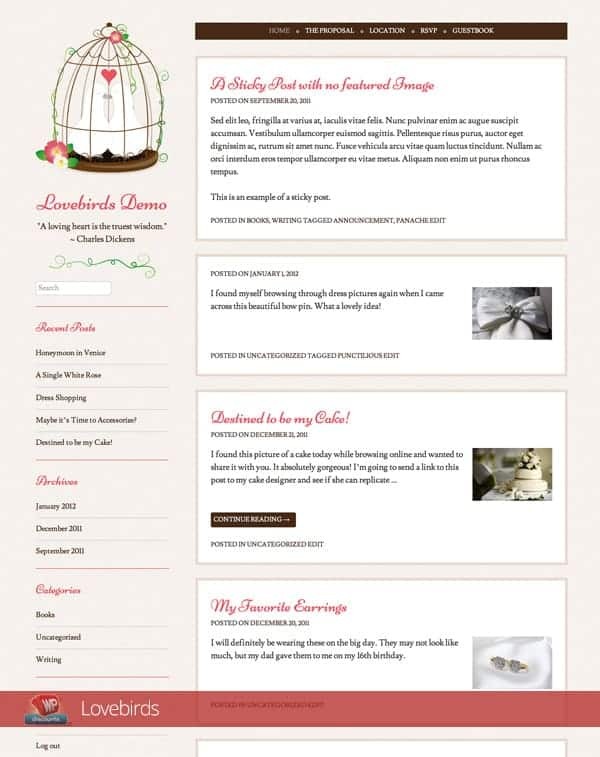 This is a collection of 13 completely free WordPress wedding themes you can use no matter if you are in some wedding-related business, or a couple who wants a gorgeous website for their special day. Bridal Show features all the essential options of a functional wedding photography theme. Its classy, elegant design is enjoyable for browsing through, with nice color combinations and subtle patterns. An auto play slideshow effect is featured on the homepage so you can present photos from your album in a quite interesting way. Featured thumbnails for displaying your posts and images are included, and your visitors can comment on them if they want to. 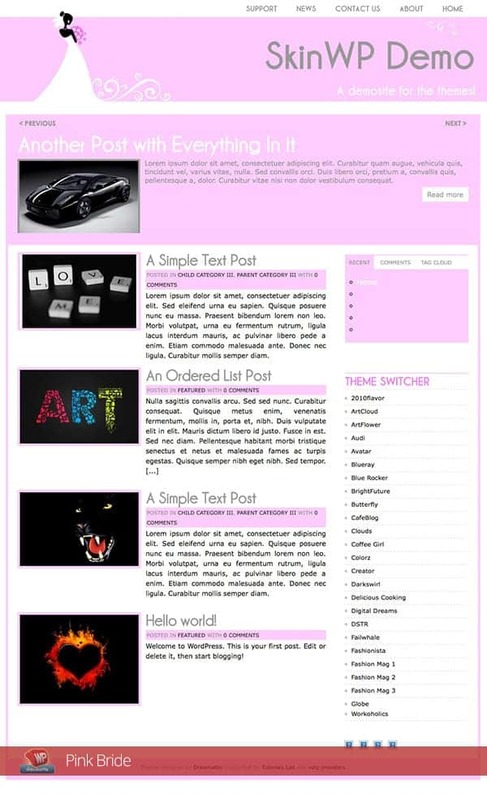 Custom menus and widgets are also included. 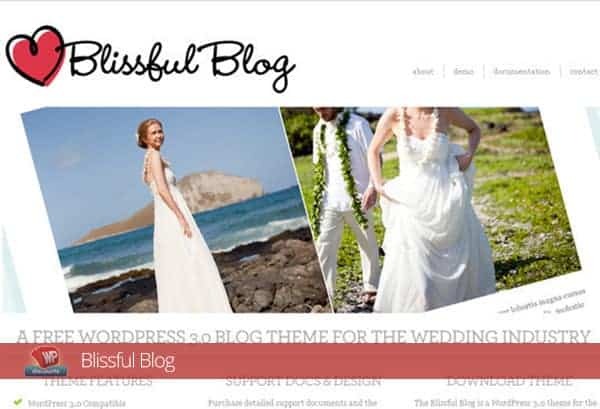 Blissful Blog is a theme that can be used for any element of the wedding industry. A traditional blog layout is featured and there are several features added to make the best out of new advantages the newest WP platform offers. You can customize it very easily and add your own background, logo or add featured images. The theme design is fresh and clean, there are multiple widgetized sections included, a photo gallery and simple menu management. 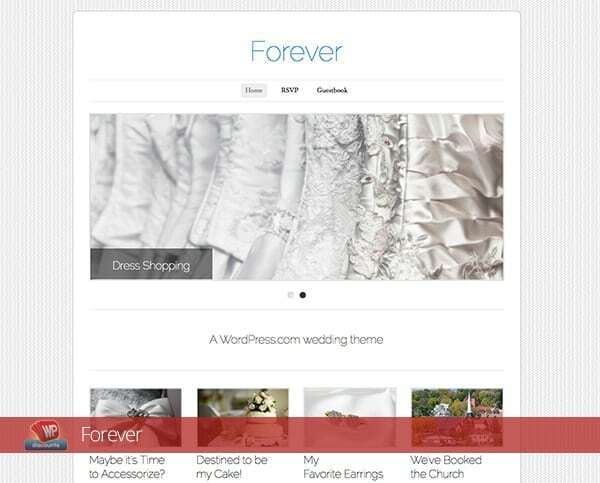 Ever After lets you create a website where you can place a whole lot of content and share every detail about your wedding with your friends and family. 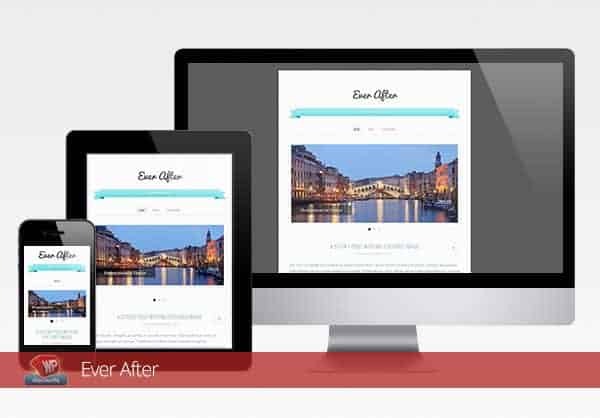 This responsive theme features a one-column layout, which is perfect for presenting your photos and videos, and it is decorated with cute textures and details that enhance the whole theme and give it a soft, romantic feel. Forever looks romantic and it allows you to present your best wedding photos and videos in an appealing way all of your friends and family are going to like. You will be able to tell your love story through many blog posts and give everyone a clean insight of your romantic fairy tale and all its important dates. Lovebirds is bright and very sweet, just as its name suggests. With pretty fonts, light pastels and beautiful graphics this theme is going to present your wedding day in a fresh yet romantic way. You can post as much as you want and talk about all the details of your wedding, set each important date and hour right so all of your guests know what to expect. Pink Bride is a personal wedding theme with an elegant pink design, and a few useful custom widgets where you can show photos from your Flickr account. Surely you can see now that creating a wedding website doesn’t have to be expensive; it can actually be completely free. While these themes do actually offer a lot of great features, if you want higher quality and customer support included and you’re able to invest a bit in your website you should check out the largest premium WordPress wedding themes collection online, with the best possible wedding themes presented. It’s an interesting wedding theme for posting stunning images of every precious moment of wedding.